2007, Stowa present 80th anniversary limited edition of Flieger Automatic and Flieger Original. So, we are now at 2016. That means next year is 2017, which is STOWA's 90th anniversary. We should have an anniversary limited edition. 2017, Stowa present 90th anniversary limited edition of ........? So for those who are keen, we better start budgeting now, just in case that you love the offering. Also, what you want for 90 anniversary? 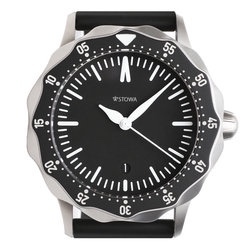 I'm really digging the bezel on the new Flieger Professional, and it'd be quite spectacular if stowa offered that with a more traditional Flieger dial! How about Flieger Original with 43 or 45mm case using durowe? logan2z and StefB like this. Prodiver with bracelet, custom 90th Anniversary engraving on caseback, and, for my money, navy blue dial with white hands. tsteph12 and gward4 like this. A remake of a dressier piece would be an interesting celebration. Saves a special flieger for the 100th. hidden830726 and Peter Atwood like this. Peter Atwood and Furball like this. I have the earlier 80th anniversary edition, and would certainly love to have a special watch for the 90th anniversary. Ideally though 40 or 41mm. I'd like to see an updated version of the French army watch from the 1950's, the one with the red second hand. I don't know as that would be a good candidate for the 90th anniversary watch though...perhaps one of the Anteas? A great choice would be a Seatime chronograph in the style of one of the 1960's models. Last edited by Peter Atwood; July 24th, 2016 at 13:57. StefB and waveoffaze like this. So, we are now at 2016. That means next year is 2017, which is STOWA's 90th anniversary. Pforzheim, the former hometown of the ancient STOWA watch company will be 250 years old in 2017! That's a chance for Joerg to connect both these anniversaries to one exceptional Jubilee Watch.